The detection of frail older individuals living in the community represents a crucial preliminary step in the development of effective prevention against disability and age-related conditions. However, currently available screening tools for the identification of frail older persons have two major limitations: very few are designed for self-completion, and none discriminates between frailty and disability. 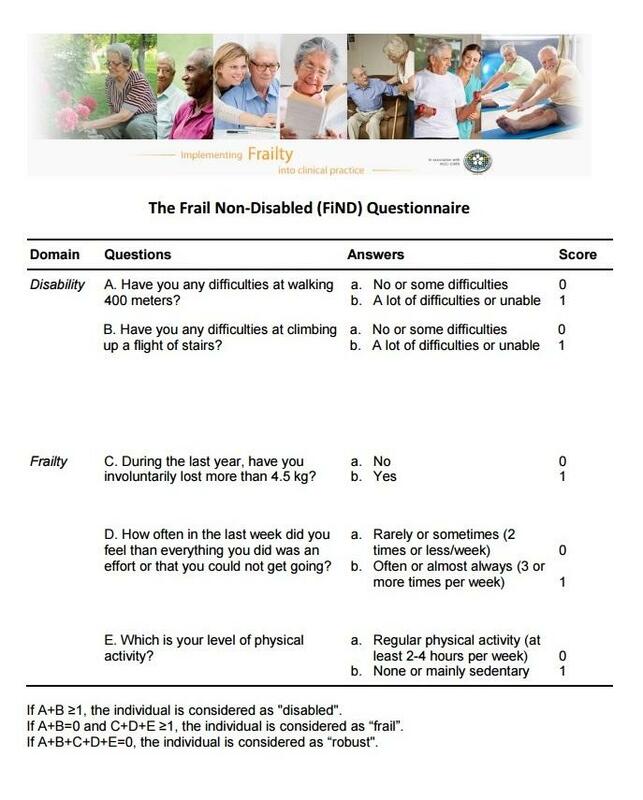 In order to foster the identification of non-disabled older persons living in the community, the authors designed the Frail non-Disabled (FiND) questionnaire, which follows the main multidimensional construct of the widely adopted frailty phenotype, but also includes a specific section for excluding the presence of mobility disability. The FiND questionnaire consists of five questions: two are specifically aimed at identifying individuals with mobility disability, and three assess components of the frailty syndrome: weight loss, exhaustion and sedentary behavior. Cesari M, Demougeot L, Boccalon H, et al. A self-reported screening tool for detecting community-dwelling older persons with frailty syndrome in the absence of mobility disability: the FiND questionnaire. PLoS One 2014;9:e101745.